Normally, when I go play hockey, there are people who join me for food afterwards. However, that is never the case on Thursdays. You see, this group likes to head home once we're done. I guess it has something to do with it ending at midnight. I suppose it makes sense. After all, it is a weekday night and people do have to work the next day. Hey, that hasn't stopped me... So, when I found out that Rich Guy was back in town, I took a chance and asked him if he wanted to join me for some food after my game was done. Seeing how his internal clock was still on Filipino time, he was wide awake at m idnight. So when he said yes, that is when I broke the news as to our destination - Lucy's Eastside Diner. Why the delay on the information? 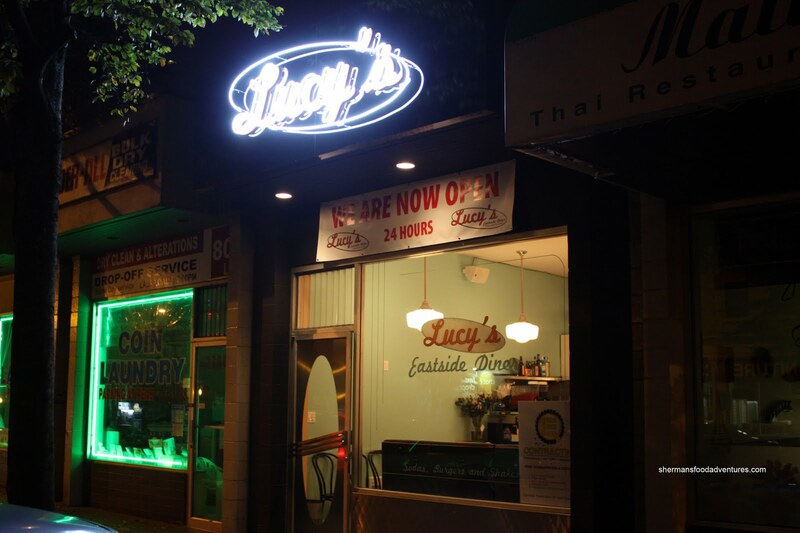 He lives in Coquitlam and Lucy's is on Main Street, near 11th (a couple of stores down from Cafeteria). I convinced him that it would take him less than 1/2 hour to get there at that time of night. I gotta give it to him. He was game and I'm really lucky to know people who will not only let me violate their food with my camera, they make an effort to come out to eat. I originally found out about Lucy's a couple of days ago w hile I was driving down Main on my way into Downtown. It caught my eye and I almost stopped to check it out. Alas, I was on my way to other eats already. Besides, I wanted to wait for someone to join me. Tonight, or should I say this morning, we were ambitious and ordered 3 dishes to share. Rich Guy went for the Three Little Pigs, which consists one each of bacon, ham and chirizo Benny. The individual components were prepared nicely such as the perfectly poached eggs and crispy bacon. However, the Hollandaise was far too rich. It had a nice lemon zi ng and it was smooth; however, it was very hard to eat all of it. Furthermore, the hash browns were both strange looking and gummy. For myself, I had the Burger and Milkshake combo. For $10.00, it seemed like a good value since a milkshake alone costs $6.50. The burger itself was pretty average. The beef patty was a bit dry (yet nicely cooked) and got lost in the dense Kaiser bun. The accompanying fries were sub-par. They were not crispy at all and rather limp. 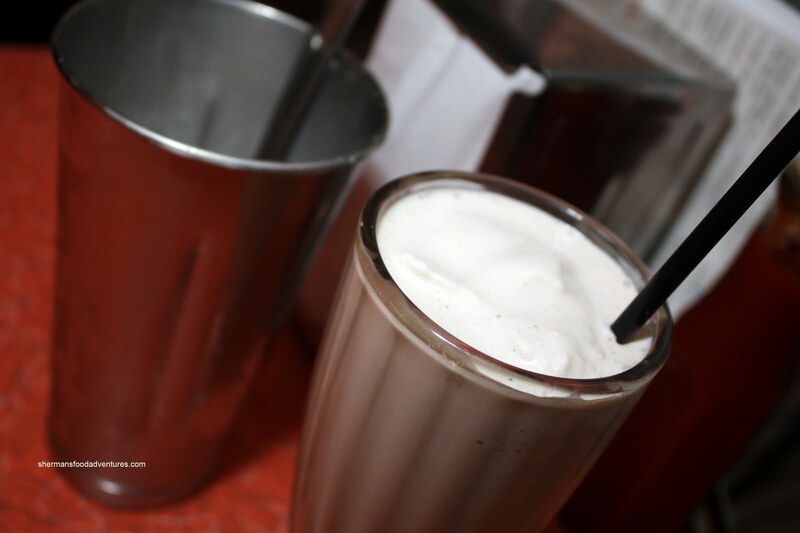 As for the milkshake, we found it to be very good. Not too sweet and with plenty of vanilla flavour. 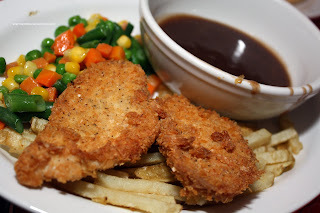 For our 3rd entree, we got the Fried Chicken with fries, gravy and veggies. When it arrived, we were surprised that it consisted of 2 small pieces of fried breast meat. Although it was crispy, the meat was dry and the flavour was quite muted. No specific flavour stood out other than pepper. It came with the same limp fries; but at least the gravy made them more edible. The veggies were your typical frozen mix type (they were cooked properly though). After all this, I could still eat a little bit more. Actually, I just wanted to try their Mac 'n Cheese... It arrived baked au gratin and bubbling hot. 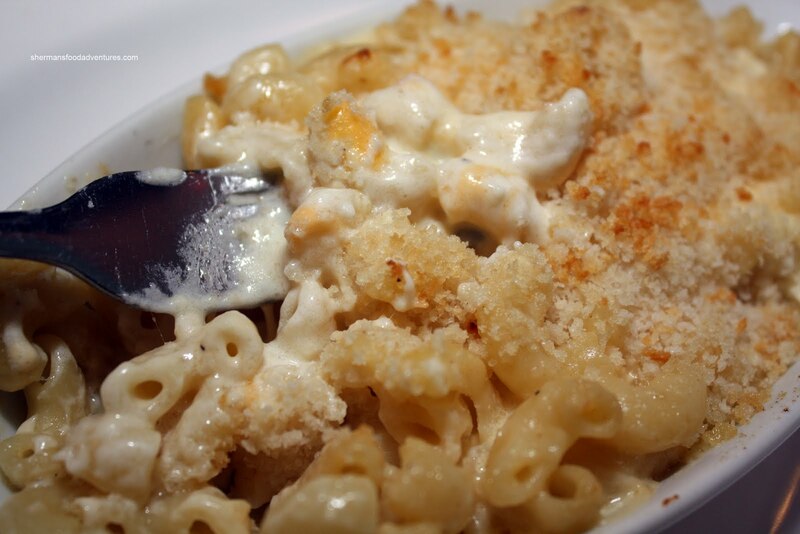 The macaroni was still al dente and the chee se sauce had a nice sharp taste to it. I liked how there was a nice cheese taste without being salty. Overall, the food is hit and miss. It needs some work. Moveover, food presentation has a lot to be desired. There is an obvious attempt in offering something a bit different. Definitely some potential here despite the average food. With all that being said, the prices are very reasonable with most items well under $10.00. Portion size is pretty much reflective of the pricing. Kudos to them for staying open 24 hours a day. It fills the void of establishments that are open all the time. I went last Thursday as well after dodgeball, and had the burger combo. The fries were oversalted & kind of limp & pale, along with my patty & my friends meatloaf, fried chicken..and their accompanying mixed vegetables. It seemed the only thing NOT salty was the milkshake. However.. they have just opened, so perhaps they are working things out. BUT PLEASE, for the love of all good things delicious, please taste test your food before it goes out. The only thing so far that will keep me going back is the fact that they are open 24hrs and it's a much needed alternative to No.9 or the Naam. Well, you have to give them credit just for the fact it is open 24 hours. I guess, based on that, some dishes can stand that longer, others can't. I am surprised the burger wasn't as good, though, considering it is something that has to be prepared to order and the hollandaise was very rich and, can I say, good. 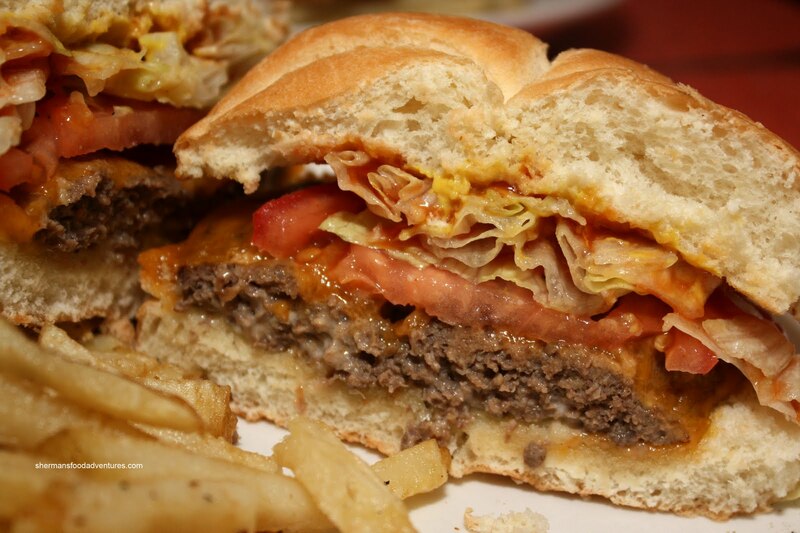 The question is whether food is the same at night or it might be different for lunchtime. Makes me wonder... Still, at $10, it sounds like a deal! Hm...I was excited to learn that Lucy's was opening but have been hearing very mixed reviews on it. I'm wondering if they are literally using the concept of a 'mom and pop' or 'diner' place. From the sounds of it, you can't really compare it to places like the neighboring Cafeteria. But I'm going to go try it myself too because I'm a Main street girl at heart and I support that area. But like you mention, if the food was just so so, I hope do they improve over time. Kevin, ditto, that's what we thought. If there was nothing else open, we'd might consider going here, but the food isn't really all that good. Kim, well, for the 4 dishes we had. It wasn't impressive at all, even at the lower price point. I hope they improve because I like the concept. I actually just came from there and went on urbanspoon to check out the reviews. I am surprised that only 50% lof voters likes it. I had a great meal! Definitely recommend the peanut butter milkshake, it wad amazing and we got the 26oz for the price of a 13oz cus the chef went overboard and gave us too much. No complaints there! I had the pulled pork sandwich. It was my first pulled pork sandwich so I'm not sure how it's suppose to taste but I loved it. It was juicy and delicious, I normally hate mayo but loved it on this sandwich. Had poutine with the sandwich, gravy was a bit too salty and fries overbooked but overall very happy with the meal. I've heard that the fried chicken isn't the best because the white meat makes it really dry. My friend had the marshall burger and he raved about it. My boyfriend had the quad Benny, think 3 little pigs with an extra, he's a huge Benny fan. Spends a lot of time to make his own hollandaise just for one breakfast and he said the hollandaise was rich but it's suppose to be a rich sauce. On the other hand the other friend had the biscuits and gravy and sausage. The sausage was cold and gravy too salty. The food was 3/4 hit for the 4 of us and the service was awesome. Our server was friendly and nice and exactly the kind of homey service you'd expect from a neighborhood diner. Well, it appears you had a better meal than I did. 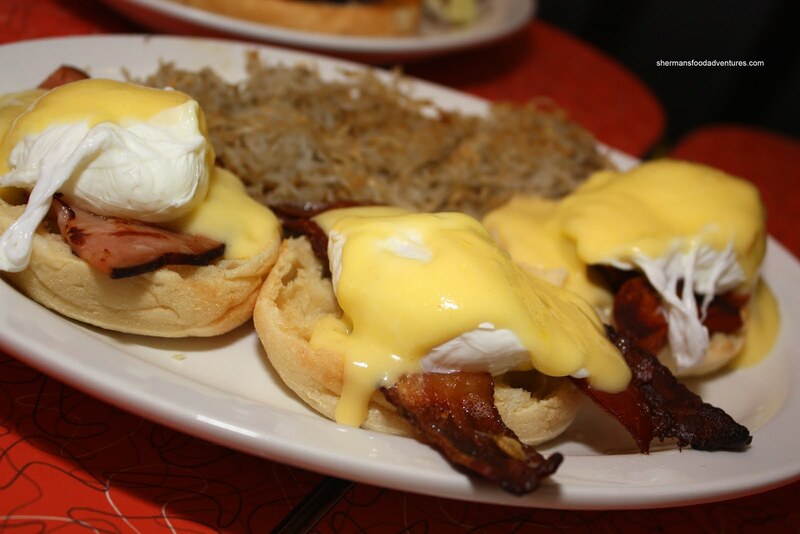 In terms of the richness of the Hollandaise, naturally it will be heavy due to the egg yolks and butter. However, just because it is supposed to be rich, it can be too rich as well. Just like adding too much salt, you can make something too salty. Compared to the many versions of Hollandaise sauces I've had and ones I've made myself, my dining partner and I thought it was too rich. As in the rest of the food, it was okay for the price; but I've had better. Compared to other diners in the GVRD, it did not impress me. I'm not surprised at the Urbanspoon rating to tell you the truth. The food has potential; but it doesn't measure up at this moment. I do like that it is open 24 hours and the service is friendly, if not a bit sparse. I try to be fair in my blog posts and compare with similar type of establishments. I feel that I have visited enough of them to give a fair and evaluative post.